Despite rostering three quarterbacks log 300-plus snaps, the Cardinals won four of their last six games and finished the 2017 season at 8-8. On the surface, 2018 appears to be more of a rebuild. Head coach Bruce Arians and quarterback Carson Palmer both retired this offseason and were replaced by Steve Wilks and Sam Bradford, the latter who signed a one-year deal. Bradford flashed in Week 1 for the Minnesota Vikings, but played just 26 snaps the rest of the year after injury. 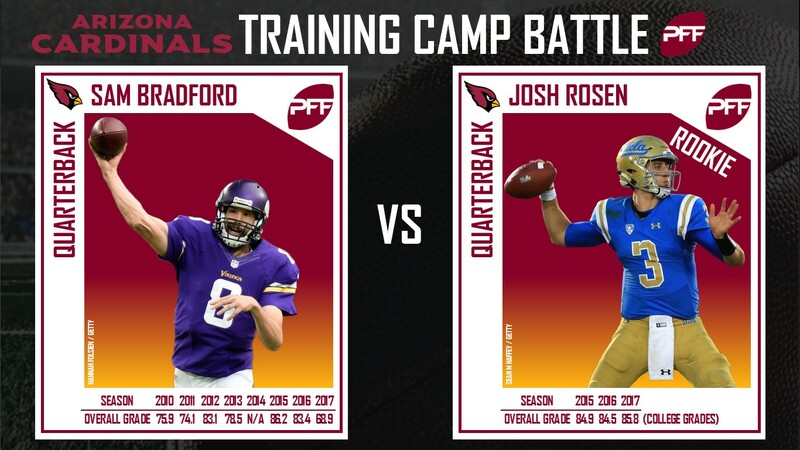 The team traded up to draft former UCLA QB Josh Rosen, and if Bradford is the bridge quarterback initially, his injury history suggests Rosen will likely get a look as a rookie. While the quarterback competition will be the headliner, the Cardinals have uncertainty at other key positions they hope to resolve in camp. As Wilks enters his first training camp, he could begin making his imprint on a team that’s currently in the transitional phase. Lost in the quarterback shuffle of 2017 was that the heartbeat of the Cardinals’ offense played just 46 snaps on the year. David Johnson was one of the league’s premier running backs in 2016 and showed his unique versatility in the process. Johnson led all backs with 509 routes run while being targeted 107 times that season and actually finished with the highest receiving grade of any player in the 2016 season. He was very efficient despite the volume as his 1.73 yards per route run ranked sixth among all qualifying running backs. Even after rushing for nearly 1,300 yards, Johnson’s yardage total wasn’t just boosted by a few chunk plays. While he had 11 runs of 15 or more yards, his breakaway percentage of 24.2 ranked just 29th among qualifying backs in 2016. The return of Johnson’s dual-threat ability will make life easier for whoever the Cardinals have under center. Rising second-year safety Budda Baker played no more than eight defensive snaps in a game until Week 10, but he made his presence known after that. Baker who figures to be the Cardinals starting strong safety finished his rookie year with the sixth-highest grade in run defense among all safeties. Baker’s run-stop percentage of 6.4 ranked sixth at the position, but within eight yards of the line of scrimmage at snap, those numbers jumped to 9.2 and third, respectively. From Week 10 on, his teammate Antoine Bethea was tops in stop percentage within eight yards of the line of scrimmage at snap as well, giving the Cardinals two top-five performers in that regard. Even though the Cardinals have Johnson returning, the current roster holes could make it tough to contend for a playoff spot. Aside from stars Larry Fitzgerald and Patrick Peterson, the receiver and cornerback positions have question marks. While they drafted Christian Kirk and signed Brice Butler, the pecking order at wideout behind Fitzgerald remains unclear. At corner, they’ll be looking for someone opposite Peterson and in the slot after Tramon Williams signed elsewhere and Tyrann Mathieu was released. On top of that the offensive line has upside, but due to injury concerns remains shaky, finding themselves ranked 27th on our preseason offensive line rankings. Year 1 under Wilks figures to be a transition on both side of the ball, but by the end there should be more answers than questions regarding the team’s direction.